Hello girls, I am so sorry I haven't posted in a ages. I've been stuck in the library doing uni work, I feel like a zombie right now. I keep having this fear that I'll get behind in everything so I'm trying to be a keen bean and get everything done. I am starving and someone has ordered Domino's in here..Not fair! I hope you've all been okay. Apart from reading Roland Barthes theory on Image, Music and Text, I've had a pretty non existent week. Oh, oh I am having a Halloween party on Monday though! I know, I'm shocked to. I'm not the party host type, but Louise (the girl who lives with me) has persuaded me into it. I'm actually really excited! I'm either going as Wonder Woman or a vampire french maid. I watched Eve's Tambourine video the other day and became inspired haha. Love both of the outfits, Kim Kardashian as Wonder Woman = Wow. My whole family tree are driving down from London to see me, I'm quite surprised actually. I rang my mum the other night and got 'Can't talk to you now, the Michael Jackson trial is on.' It's nice that she's concerned about her daughter.. I feel very guilty that I haven't posted in a while, so I'm going to do another Halloween post for you all now. What are you all dressing up as for Halloween?! 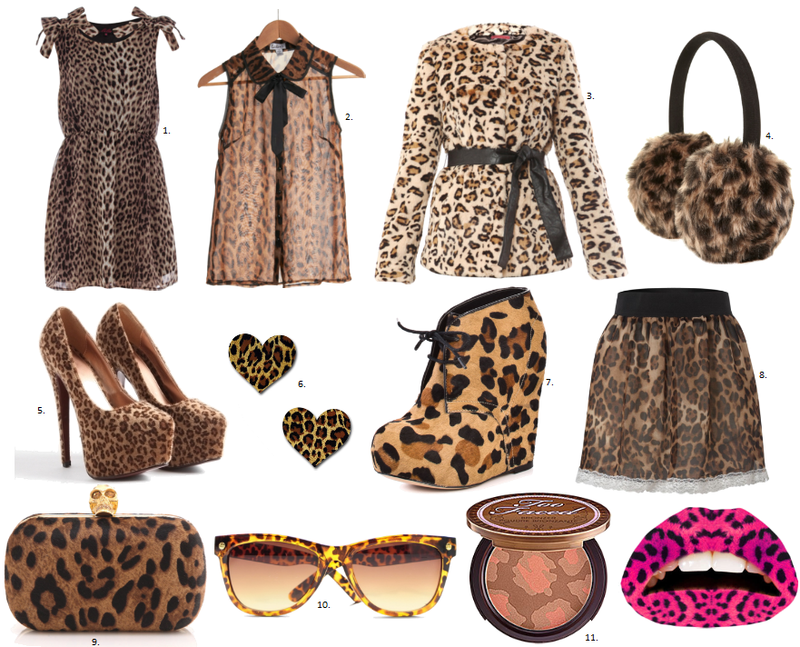 I'm in love with leopard print! I just blogged about it today too! http://BeautyStyleLove.blogspot.com a cute leopard beret, less than $10. Great photos you picked for this post, love 'em all! I know, it' such an amazing trend! 1,2,5,6,7,9 are my favourite!!! WOW! I'm so in love with all of this!!! I love leopard too, so this was great post. Hmm I'd love to get that top nr 2 the most, lovely! i love the ear muffs so cute and the heels !! The clutch is gorgeous, it would be illegal to leave it out of your list. I love leopard print! Your blog is so cute, I love it! I am a new follower by the way! Number 7 boots are Fabulous!